Alan Stein is one of the premier basketball strength and conditioning coaches in country, and is known all around the world. He currently serves as the head strength and conditioning coach for national powerhouse DeMatha Catholic High School. 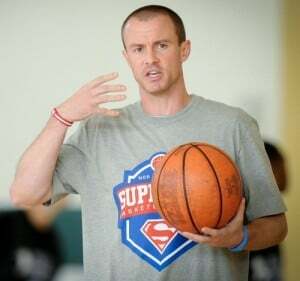 Alan also a consultant for Nike Basketball and works multiple well known basketball camps each summer (Nike Summer Skills Academies, NBA Players Association's Top 100 Camp, and the Chris Paul CP3 Elite Backcourt Camp). The list of accomplishments and players he has worked with could go on and on and the list continues to grow on a regular basis. He is an innovator in his field and is respected all around the world for what he does. Just in talking to Alan you get a feel for how passionate he is about the game of basketball. He really loves helping players develop physically and mentally. Coach Stein has allowed us at Basketball HQ to ask him a few questions about some of his coaching experiences and tips for basketball coaches and players today. Here is the Alan Stein basketball interview. BHQ: What made you want to become a basketball strength and conditioning coach? [Alan] Basketball has been my #1 passion since I was a kid. As I progressed through high school and college I took a very strong interest in strength & conditioning and performance enhancement. So this is literally my dream job! BHQ: As someone who is known worldwide and at the top of their profession what motivates you to continue to improve as a coach and to consistently get better? [Alan] While I am proud of the things I have accomplished and the experiences I have had… I most certainly have not arrived… and haven’t even scratched the surface of what I want to achieve in this profession. I live by the motto, Be > Yesterday! BHQ: What is something that you would recommend to younger players who are just starting to get in the weight room and work on their strength and conditioning? [Alan] There is more to basketball athleticism than how fast you can run, how you can jump or how much weight you can lift. Don’t get distracted by numbers. Focus on doing things the right way and training with purpose. BHQ: How important do you feel mental toughness is in the game of basketball and what are some of the ways to improve mental toughness? [Alan] Mental toughness is important for success in ANYTHING. Contrary to many definitions, true mental toughness is merely your ability to ‘Play Present’, which means, to focus on the next play, focus on what you can control, and focus on the process. BHQ: Who are some of the people in your life that have positively influenced you to get to where you are at today? [Alan] Wow, too many to name! I have been so fortunate to work with and learn from a ton of amazing basketball coaches, strength coaches, etc. BHQ: What are you most proud of accomplishing so far in your coaching career? [Alan] That I have been able to maintain solid relationships with players long after I worked with them. I am all about relationships and basketball/strength h& conditioning is my vehicle for creating them!